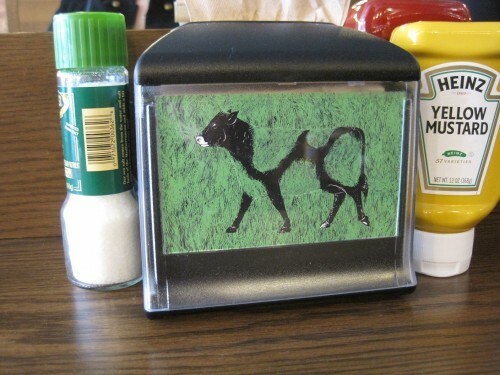 Flatiron Lunch: Have a (Grass) Cow (Burger), Man! I’m on board with more restaurants offering sustainable food, and I have been known to drink the Michael Pollan kool-aid from time-to-time. 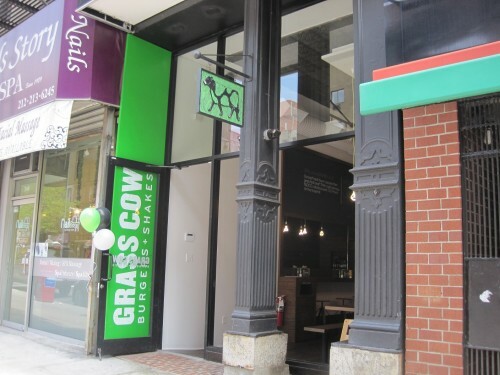 I love burgers, well, really, cheeseburgers, so I was excited when Grass Cow Burgers and Shakes opened about a month ago on 3rd btw. 25+26th. Grass Cow’s space is inviting enough to want to sit and eat, but there aren’t a ton of seats, so take-out makes sense as well. The only option on the menu is a burger ($6.25) with or without grass fed dairy cow produced cheddar ($1.25 extra), an optional extra patty ($3.75), and a seasonal topping that’s priced depending on item (when I went it was avocado for $1.50). How would I describe this burger? Well, it was better than average, juicy and satisfying. The cheddar had a nice bite to it. And I think it would have tasted even better if it wasn’t overcooked (it looked past medium to me.) I think it would be fair to say their burger is similar to Shake Shack. Even though they pushed me just over $10 the fries where a necessary edition addition. They were potatoey and salty. They could have been a little crispier. When I was there, a gentleman was on a ladder chalking by hand some of the quotes and signs on the wall. This one was already done and caught my eye. 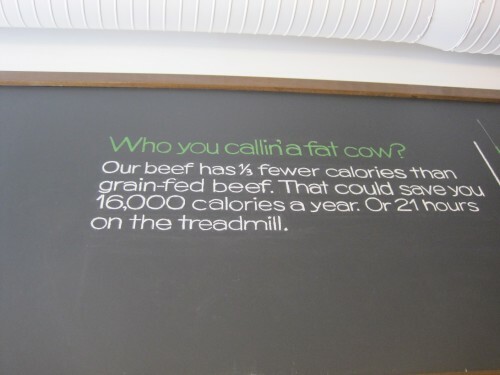 I appreciate that studies may show that grass-fed beef has fewer calories, but let’s be real, people. We are still talking about a burger, fries and shake. We will need to be on the treadmill either way. 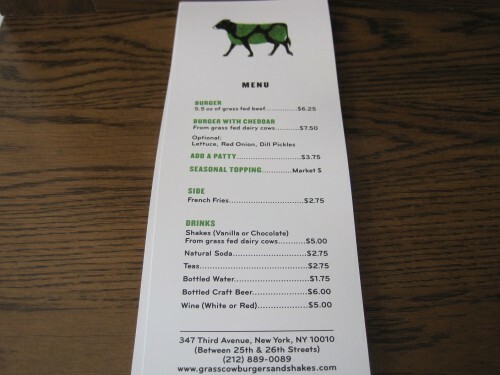 While I admire Grass Cow’s attempt to offer a sustainable menu (I mean, look at this logo), I couldn’t help but notice some inconsistencies. I’m sorry but avocado may be seasonal right now somewhere in the world, but, as far as I know, it is never seasonal in the New York region. Currently, our farmer’s markets are starting to blow up with spring produce, and while I could see that an asparagus topping might not be so popular, it would at least be consistent with their mission. And I’m surprised they offer regular Heinz ketchup, when they could offer Simply Heinz, made without high fructose corn syrup, or even something better like, Sir Kensington’s regular or spiced ketchup. 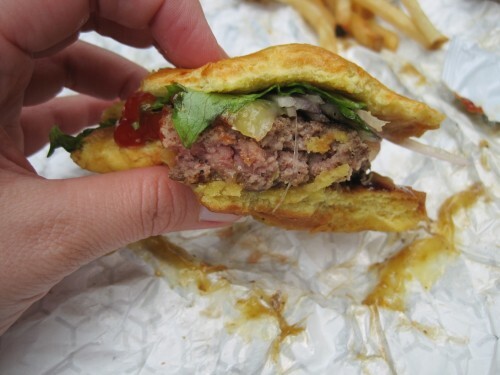 Even with these small problems, Grass Cow serves a delicious burger that I would be happy to eat again. Grass Cow serves an excellent burger. With grass-fed beef, I get an environmental warm and fuzzy feeling with my healthier meal. Grass Cow sticks to the basics. I’m sick of the grass-fed beef fad. Taste should be the priority. If they only have to worry about one item on the grill, they should at least get the doneness right. 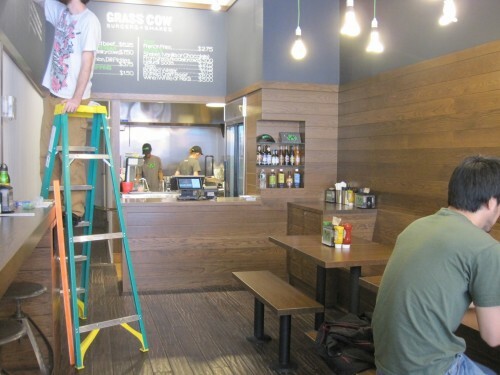 Shake Shack is just a few blocks away and has more options and outdoor seating. Posted by Sarah Zilinski at 9:00 am, May 31st, 2013 under Flatiron Lunch. looks pretty medium on the picture and looks good. Too bad we don’t have a place like this in midtown east. The fries do look bad. 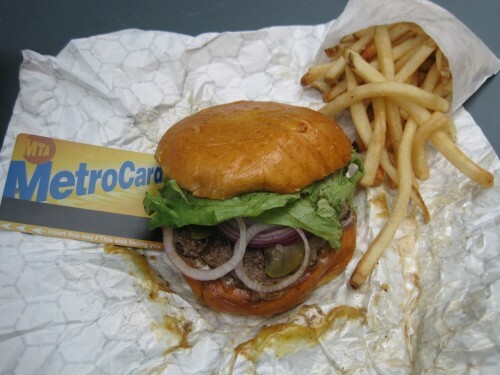 You are right about the photo, but I remember the burger looking more grey and less pink in person. Bareburger just opened on 46th Street between 8th and 9th. EVERYTHING, down to the ketchup they serve, is organic and natural. They also have a MUCH more extensive menu including exotic meats like Elk, Ostrich, and Buffalo, plus plenty of excellent vegetarian and vegan options. There are other locations in the City as well, but it is nice to have one in Midtown West now. Prices for a basic burger are in the higher end of the Midtown Lunch range, but there is a lunch special with a burger, fries, and drink for something like $11.95. Fries are a necessary ADDITION. Therefore I suspect a second EDITION of this article might also be necessary. Fixed! And for the record, I totally appreciate the entertaining way you pointed out the error. If only all my errors were observed in such a witty fashion! Technically, avocados are in season all the time. Their trees are capable of producing fruit year-round, it is based on climate. That said, I’ve yet to see an avocado tree in the city.